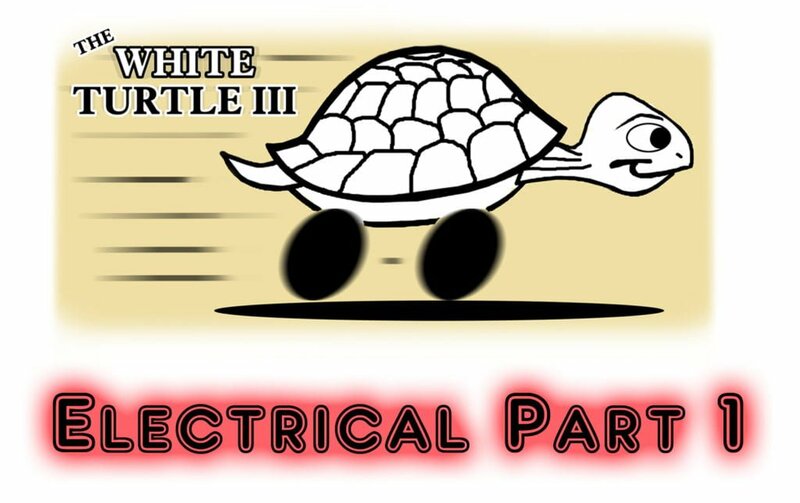 Electrical - Paterson Photography - White Turtle !! !- Let there be power! It is electrical !!!!! After putting it off I finally got around to working on the vans house electrical system. I love electrical but at the same time it scares me. The biggest issue is connecting the house battery to the van, but after reading and laying out diagrams I went for it. Really electrical is not that complicated, positive goes to positive and negative goes to negative. The issue in Lethbridge is that the supplies to do this are VERY VERY limited. Like most projects that are out of the ordinary you hear a lot of “you want what to do what”? So after many trips to different retailers I had a pile of raw materials and started to cut, strip and put on lugs to all the wire before I could hook things up. As I worked away a couple changes happened that cleaned up the install and simplified the layout. After working for several hours on Friday I found out that I needed more wire and a couple more lugs and I still was trying to find two fuses or a fuse and circuit breaker so I made up a shopping list for Saturday. Three hours driving around town Saturday morning and I had all the supplies to finish the project. For years I have had a lot of tools but they were packed away under the steps of the house. Whenever I did ANYTHING it took hours to find the tools needed for the job. Many times I knew I had a tool but could not find it so I would use other things to make do – BAD IDEA!!! With a garage it is so nice!! Tools are easy to find, they can be left out till the job is done and I don’t have to use the wrong tool. Cutting and attaching connectors to the wires was one of those things that without the right tools can take hours and is VERY frustrating! With the right tools it was so easy. In fact I would say it was fun to do. I still went overboard with wrapping all the connectors in tape but I was doing it for extra security and not from being worried that they would come apart. For me the layout is a fluid thing. I change as I go to meet the demands that I have and to get things to fit and work like they should. My first thought was to put the battery at the back and have two batteries. 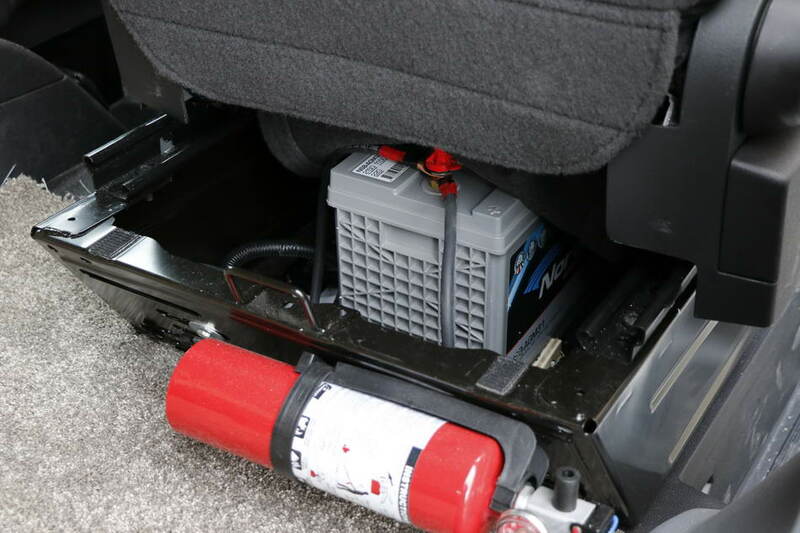 After looking at all the space under the passenger seat I decided that I could use that space and keep the battery up front to save on wire runs and that one battery would work for now. 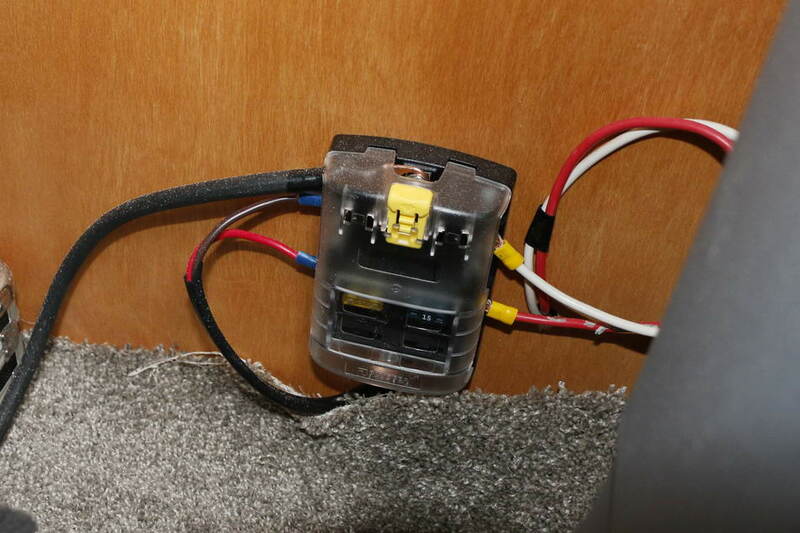 Then I thought of putting the fuse box inside the cupboard but found a great spot behind the drivers seat to use space not used for other things. By mid afternoon I had the bulk of the power system run and ready to hook up the accessories.